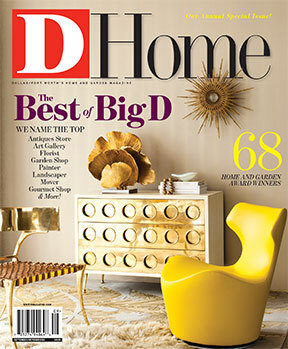 By D Magazine | 6 years ago The finest furniture, antiques, and accessories in Dallas. By D Magazine | 6 years ago Essential help for the domestic front. By D Magazine | 6 years ago The services and accessories you need for great yards. By Laura Kostelny | 6 years ago Gregg Lovell and Eric Bivins didn’t let the fact that their Fort Worth dream home wasn’t on the market stop them from making an offer. By Laura Kostelny | 6 years ago Designer Mike Mousel transitions a home from powder blue traditional to cool and contemporary. By Rhonda Reinhart | 6 years ago Greg Barker specializes in transforming something old into something new, and his home is a prime example of his power to resurrect. By D Magazine | 6 years ago We pick the top cultural spaces in Dallas. By D Magazine | 6 years ago Where to get the gourmet treats for your next dinner party. By Laura Kostelny | 6 years ago How effective, and healthful, are these liquid diets? An expert weighs in. By D Magazine | 6 years ago Dwell With Dignity offers a hand to those in need. By D Magazine | 6 years ago A house for a person of refined tastes. By Joslyn Taylor | 6 years ago The interior designer trades spaces in the Design District. By Joslyn Taylor | 6 years ago Jan Showers’ latest book showcases a bevy of Glamorous Retreats. By D Magazine | 6 years ago Find a house in Munger Place, Lakewood, or Prestonwood. By D Magazine | 6 years ago A place in Edgemont Park, Kessler Park, or Cochran Hollow. By D Magazine | 6 years ago 5 bedrooms in University Park, 4 bedrooms in Lakewood, or a Northwood Hills ranch-style. By Todd Johnson | 6 years ago Although it's falling apart around me, it’s hard to move on.